I'm a fan of Facelets when it comes to templating for JSF applications. Prior to version 6.1 of NetBeans I was using the nbfaceletssupport plug-in. Sure, it had its quirks, but overall it was a good plug-in. After installing NetBeans 6.1 and really got into using all the new cool features (shared libraries being the most significant) I realised that the nbfaceletssupport plug-in for NetBeans 6.0 didn't work and a fix had not yet been released at the nbfaceletssupport project site (note: Po-Ting Wu of Sun Microsystems has provided instructions on how to re-compile the plug-in for NetBeans 6.1). This also happened when I switched from NetBeans 5.5.1 to 6.0, so I anticipate that this will also happen in the future. 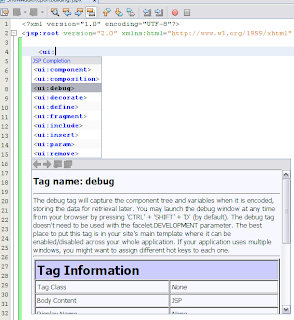 So, I thought to myself, why not use the powerful XML support already built-in NetBeans to give me what I need. What I really needed the plug-in for is code completion. So, here goes. First I decided to drop JSP pages (.jsp) for JSP documents (.jspx). The difference being that .jspx is pure XML and .jsp is HTML. When creating facelets file as JSP document in NetBeans you will automatically get code completion (without any third-party plug-ins). and that the faclets tag library descriptor (TLD) is accessible in the classpath (eg. /WEB-INF/tlds). This is stupid, We have hundreds of *.xhtml files in our project, i will not be changing their extension now. If you don't want to rename your files I recommend that you follow the instructions for re-building the NetBeans plug-in - a 5 min process. i've downloaded the zip file for updates and also downloaded the latest NB6.1 installed with web features. im getting the following errors don't know why.